Back when Napster was at its peak, I downloaded some of the Police's biggest hits and declared that I didn't like them. I thought they sounded achingly out-of-it, and I didn't think their melodies were catchy one bit. I don't know if it was that I finally grew chest hairs or I listened to those Saxon albums in 2004, but now I think the Police are the finest things since Hawaiian Punch. Their songwriting exhibits two qualities perfectly that only the rarest of bands do: creativity and catchiness. And therefore The Police immediately deserve my love. This is easily one of the most popular bands of rock 'n' roll, and I probably don't have to go into great detail about their back story. But I don't have anything better to do, so I'll do it anyway. Everybody knows that the lead singer was formerly an English teacher named Gordon Matthew Thomas Sumner. But because he was terribly insecure or something, he had his name changed to just five letters, “Sting.” Forget, for now, that he turned into a sucky '80s and '90s adult contemporary superstar. He sounded positively awesome in 1978. He was the bass player, too, and he was as good a bass player as he was a singer --- if that was even possible. Andy Summers was a 30-something guitarist who liked jazz fusion. And Stewart Copeland was a former drummer for progressive rock group Curved Air. Who knew these factions would join forces and perform punk-pop music? Of course, punk wasn't really their thing. Songs like “Next to You,” “Peanuts” and “Truth Hits Everybody” all seemed like attempts to write punk music --- the tempos are sped up to furious heights and Sting does what he can to scream-sing so loud that his head would fall off. But it doesn't take a rocket scientist to notice that the song structures are far too complex for the genre. You know, punk music normally consists of three chords (if possible throughout the course of an entire LP), a lot of distortion and they smash everything up at the end. 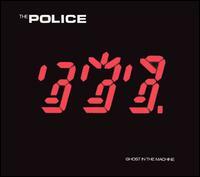 In these “punk” songs, The Police do weird things like write refrains, use instruments like “the piano” and “tubular bells” and they use a terribly posh number of chords. As much as I love punk, however, The Police were definitely doing a good thing here! And what am I doing talking about those songs, anyway? They're not even the great ones! You can't get more non-punk than “So Lonely,” a reggae-rock number that was lifted straight from a Bob Marley song. The only thing punk about it is a vague nod to it with the chorus (which I'd imagine they wrote to sound modern). Of course, the public ate it up, and it sparked a revolution! (Er, I think it did, anyway.) “Roxanne” is surely the most famous song, and the album's best in my opinion. The smash 2001 blockbuster Moulin Rouge helped propel the fact that it's a tango and not a reggae hybrid. Well, it's a fantastic work, and everybody should know it by heart by now. As if that wasn't enough, this album even contains “Can't Stand Losing You,” another phenomenally catchy hit! Instead of separating punk and reggae into verses and chorus as in “So Lonely,” they homogenize it, and the result is something entirely original. And to keep things even more fun and interesting, they close the album with “Masoko Tanga,” which seems reminiscent of The Talking Heads! Sting's singing in a made-up language and they're playing a weird funk-groove with world-beat leanings. All of this one year before “I Zimbra” was recorded. Interesting! There are a couple flaws I should mention... If “Born in the '50s,” an average hard rock song, and “Be My Girl – Sally,” literally a poetry reading, were not included I'm sure this album would have achieved an even higher score! But as it stands, Outlandos D'Amour (which is a French term for “Outlandish Danishes,” by the way) earns an already high-score. This is an album that deserves not to be just listened to, but listened to frequently. I know I shall! 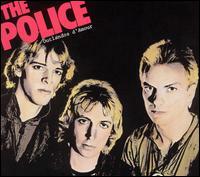 After hearing their positively unique debut, you would have at least suspected that The Police have some real talent, but it wasn't until their sophomore release when they would prove how incredibly awesome they are. This would unfortunately go Sting's head quite potently later on, but I'm getting ahead of myself. In 1979, these guys were relatively young and humble with incredible songwriting and instrumental talent, and they strongly valued originality and creativity. Whenever these elements join forces, it's they'll almost always produce attractive love child! And they gave it another French name. Ponces. There was even quite a significant departure from the debut, which had tracks that were obvious take-offs of punk, reggae, tango, world-beat, hard-rock, etc. Regatta De Blanc still has these influences, but they've been brought together in a massive melting pot to produce a truly unique sound. This is the sort of sound that comes once in a lifetime! They also had a knack for bounciness, and they had an even greater knack for catchy melodies. That's why they were so popular! “Message in a Bottle” opens the ceremonies beautifully becoming one of their most commercially successful hits of all time. “Commercially successful” doesn't always mean it has artistic merit, but this time it does. It features one of their most endurable melodies, and true style. It features a detached groove that's vaguely reggae, but it's a far cry from it. It sounds nothing like “So Lonely”on the previous album, but it embraces its spirit. They follow that up with the atmospheric and creative title track. 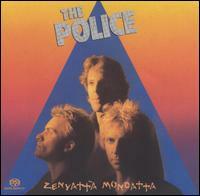 If you want to witness the drumming powers of Stewart Copeland, you needn't look further. How many other drummers do you know who can make so many clicks? This contributes to the track's intricate and evolving texture that makes it quite a memorable experience despite not having a particularly notable melody. “Bring on the Night” has one of the album's more interesting atmospheres with Summers' intricate and hypnotizing guitar pattern. I can't say I heard another song like that released previously! Along with 'Message,' “Walking on the Moon” constituted another massive hit for the group. That's rather surprising to think about considering it's so unconventional and minimalist. It's another track that not just embraces their reggae influences, but brings it to outer space. If we were going to believe Summers went to outer space to perform those guitar licks, we would believe him unconditionally. Copeland gives his drum style a particularly echoed effect (mimicking a technique I remember hearing on a Booker T. and the MG's album), which lends to the atmosphere. Maybe these guys really did play this in outer space! “On Another Day” can be considered novelty-rock. When I say that Copeland's vocal delivery there is bland, I mean that as a compliment. It matches the nature of the lyrics, which depicts a man's ordinary life gone wrong. “My Bed's Too Big Without You” is basically a complex groove with Sting giving a pompous, jazzy delivery. Many times songs like that can be awful, but this is one case when it was done perfectly. I'm hypnotized by it! Some have accused them of being sell-outs with this release, because they're sounding a bit more polished and poppy. Indeed, their budget increased, and they had the opportunity to develop and polish their sound. While the debut didn't sound that rough, it had a punkish edge to it. Whoever still adheres to that idea is being silly and idealogical... This here is a mighty creative album, and I love listening to it! Were these guys on fire, or what? Plenty of fans like to spit symbolic venom at each other arguing about whether this or Regatta De Blanc represents The Police at their peak. This is going to be a case when I want to step in as a symbolic mediator and say: “Look, both albums are great! Let us retreat into our symbolic bedrooms, turn up the stereo and enjoy them both!” But if someone was going to put a gun to my symbolic head, I'd say I prefer Regatta De Blanc. There isn't an overly important reason for that other than Regatta De Blanc has more intricate drum patterns. Also, I thought the previous album was the more creative effort. But there are undoubtedly certain aspects that Zenyatta Mondatta has over the previous. The material is certainly more consistent. Nothing here sounds goofy or throwaway in the slightest. Furthermore, there are fewer moments of crass experimentalism, which probably means this has more public appeal and might constitute a good place to start your Police collection. But I like experimentalism! Especially when these guys are oftentimes so interesting at it, that's just another reason for me to enjoy the previous work a bit more. Let's talk about the most important things. The hits! 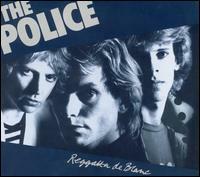 There is no such thing as a Police album without a handful of familiar radio hits, and they always made them good ones. (Although these hits might not be as incredibly well-known as their other albums.) “Don't Stand So Close To Me” has a surprisingly lengthy introduction, but it soon enough evolves into one of their catchier melodies with a rhythm that fits into their well-established white reggae style. The second song “Driven to Tears” doesn't interest me nearly as much, but it's entertaining and does have an interesting texture to impress me. “Canary in a Coalmine” is the album's definitive highlight, and it's actually the only Police song I liked back when I told people I didn't like this group. It has a somewhat silly groove, it's very fast-paced and the melody is utterly catchy. If nothing else, be sure you hear that song. “ De Do Do Do, De Da Da Da” is one of the more well-known bits ... The song title might make you think they got lazy in the lyrics-writing department, but I think they're pretty clever. Plus, it's hella catchy, which makes it one of the album's most endurable bits. “Man in a Suitcase” is another incredibly catchy ska song that's certainly worth hearing if you haven't already. Perhaps one criticism some might have about some of these songs, such as “When the World...” or “Voices in My Head” or “Shadows in the Rain” are near instrumentals and basically consist of a single overextended groove. Of course they're all much more than that! The groove itself is what makes the songs interesting, and they come up with some interesting patterns! ...But it did seem like the album would've fared better with a greater abundance of memorable vocal melodies. Although give them their due credit for creating “Behind My Camel.” That's the sort of instrumental that tries to mimic the second half of David Bowie's and Brian Eno's Heroes, which many little rock bands were trying out at this point in the '80s. But The Police succeeded when too many other bands failed ... They made it upbeat and fun. The textures change around constantly, so it's also interesting to analyze. So, I might not like this album as much as Regatta De Blanc, but they're both of extremely notable quality, and any rock fan's collection would be amiss without this addition. The Police are in top-form here as performers and songwriters to a degree that I wish other bands had the capability of meeting. Of course, there was a guy with a silly name jabbering in the microphone a lot in The Police, but the music he was jabbering was some pretty interesting stuff. Take that huge radio hit, for example. It's not just a catchy tune and a poppy beat that'll be stuck in my head the rest of my life --- they actually had the gall to put all these weird synthesizer sounds in it and make it atmospheric. I'd gather that I haven't heard too many other songs like it! Yup. That's right. Synthesizers. If you've been in a coma since 1980 and just woke up, The Police let synthesizers play a more central role in their music. But his isn't that cheap, trend-following keyboard crap that you'd hear from people like Toto. These are good synthesizers and they're used perfectly! ... Except those synths in “Secret Journey,” which sounds straight out of a cheesy planetarium program. But that was a hastily put-together song, and it should be ignored in this paragraph. And don't think that just 'cos they have synthesizers that Andy Summers is out of the job. He's definitely here, and he continues to impress us with those 'lectric guitar chops. ... And don't worry. Andy Summers hadn't been replaced with a drum machine, and I'd wager that he sounds better here than he did in Zenyatta Mondatta. “Spirits in the Material World” opens the album on an ominous note. Right away, they reveal this new synthesizer sound in lieu of something that might have been played by guitar, but you're not likely to care about that once you hear it. Its groove is intoxicating and they have the decency to give us some really weird sax. “Hungry For You” is a funny groove featuring Sting spouting off words in French. I'm not in the mood of ranking his vocal deliveries, but I'd have to say that performance is one of his all-time best. “Rehumanize Yourself” is an extremely fast-paced tune with a similar pacing as “Canary in a Coal Mine.” But the songs are entirely different --- this one experiments with an array of weird sound effect experiment, and that crazy sax makes yet another appearance. “Invisible Sun” is almost a two-chord song, but that's one example when such a harmonically uninteresting song is interesting. The droning pattern and melody they came up with adds to the curiosity of it, and the atmosphere is wholly unique. Despite its greatness, this album isn't without its flaws. “One World (Not Three)” marks Sting's very first foray into political rock, which rarely results in interesting music from anyone. It's a simplistic reggae-ish groove that would've sounded silly on even Outlandos D'Amour. Despite that, it isn't unpleasant to hear ... you can't ignore the fact that Copeland is giving it all he's got with the drumming! “Secret Journey” is a surprising misfire from the group (that I already mentioned above). Its lengthy synth-heavy musical passages are not interesting whatsoever, and I get the distinct feeling that it was last-minute filler. “Darkness” is a lackluster and disappointing conclusion. Yes, I love its drunken groove and I still consider it a good song by most standards. Just not one of their inspired moments. None of these minor missteps will ever rob Ghosts in the Machine of its status as a classic, as it is unmistakably so. But it does manage to keeps it out of the same league as albums like Zenyatta Mondatta and Regatta De Blanc. They were going more in an adult contemporary direction, and Andy Summers had less of a central role in this album than ever. 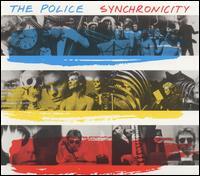 But Synchronicity is another fine album of their impressive discography. It was their biggest commercial success, too, and the public embraced such songs as “Synchronicity II,” “King of Pain,” “Wrapped Around Your Finger” and, of course the biggest tamale, “Every Breath You Take.” This was also to be the final Police studio album ... a fact they they weren't aware of when this was released. But yes they would break up a few years later and Sting would go onto make big bucks with a solo career. They're continuing down that synthesizer-led path that was explored at length in Ghosts in the Machine, but they're not doing anything wholly new. In Ghosts, they seemed to treat the synthesizer as a sandbox-of-their-imaginations, but many times in Synchronicity, it serves a strictly utilitarian purpose. “Every Breath You Take” is by all means normal pop song. It's not even remotely like that complicated concoction they had with “Every Little Thing She Does is Magic.” But that's a brilliant song, and you already probably know it by heart. That melody is so incredibly infectious that it's easily up there with the best this group had ever done. Experimentalism or no, brilliant songs are what brilliant songs are. “Synchronicity I” is the album's opener, and it's a weird little thing. A programmed synthesizer plays a funny jangly loop and Stings starts to belt out a rather unconventional melody. You've got to get a load of how they do those chord changes. Hard to describe, but it's done with some weird combination with the rhythm. It's brilliant, and that might explain why they chose to name the song that. “Walking in Your Footsteps” is a world-beat song, and they certainly did that much better with the more organic sounding “Masko Tanga” from their debut. Nonetheless, it's an engaging work, and Sting possibly delivers the least groan-inducing political message of his career. (If we have nukes, we're going to end up like the dinosaurs. ... Apparently Sting thinks the dinos had nukes.) “O My God” is highlighted by that crazy saxophone that we heard before in Ghosts in a Machine. I especially love the very end, when that manically convulsing instrument nearly regains its sanity. Despite it containing the big hits, the album drops off a bit in the second half. “Synchronicity II” is much more normal than the first incarnation, but it's an extremely entertaining song in its own right. It's a little bit prog-sounding ... something that's reminiscent of Rush earlier that decade, and it's just a well-done and fully-baked song. “Wrapped Around Your Finger”is an excellent lite-rock song with a catchy melody and an especially wonderful chorus. Though I called it lite-rock, they managed to come up with a groove that tops 99.5 percent of what I heard from less challenging musicians like Eddie Money. “Tea in the Sahara” is a bit of an underwhelming closer, though. More of a sound-effect psychedelic outing that never takes off for me. Oh, but since we all have CDs nowadays, your version of the album will probably conclude with “Murder By Numbers.” Originally a B-side to “Every Breath You Take,” it's a delightfully wicked jazz-rock song with detailed instructions on what it would take to become a mass murderer. It's very tongue-in-cheek! (After all, if it wasn't tongue-in-cheek, we'd probably be thinking of Sting as the Syd Barrett of the 1980s.) A very intriguing song on several different levels. 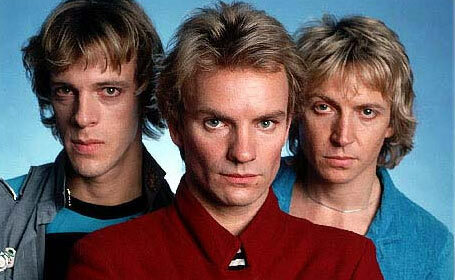 The Police's swan-song is perhaps the weakest album of their discography, but who cares? Anything that's filled to the brim with such great melodies and interesting ideas earns its place in my rock 'n' roll collection. Count this as the Police's fifth and final home run with a batting average of 1.000.